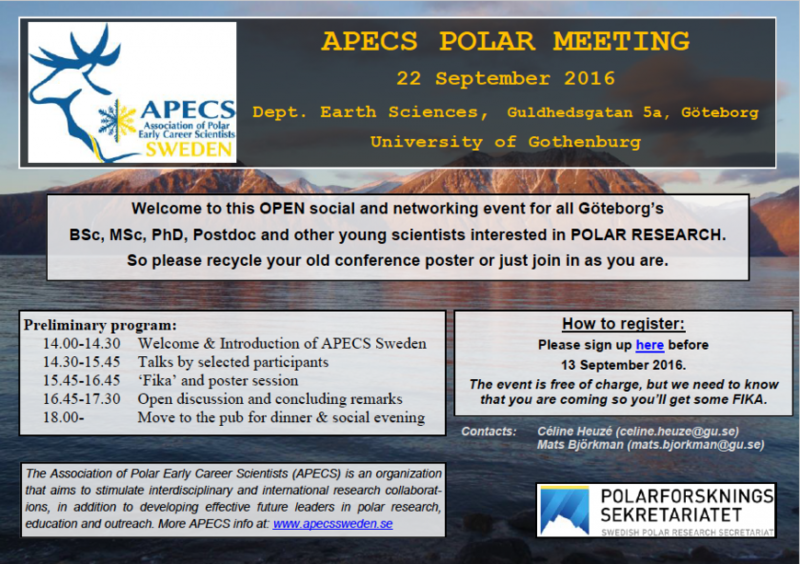 On 22 September 2016, during the APECS International Polar Week Autumn, we organize an OPEN social and networking event for young scientists with an interest in polar research. BSc, MSc, PhD, Postdoc and other young scientists are welcome! Our aim is to get an overview of the polar research taking place in Göteborg and to stimulate interdisciplinary exchange and networking. The meeting will include oral presentations and a poster session accompanied by ‘fika’. In the evening, you are welcome to join us and continue with an informal social activities and dinner. So please come and present your research, recycle your old conference poster or just come enjoy a day of polar science. The event is free of charge, including the fika (but not the dinner). To sign up, please follow the instruction found here before the 13th September 2016. Feel free to share the event. The event poster can be downloaded here.